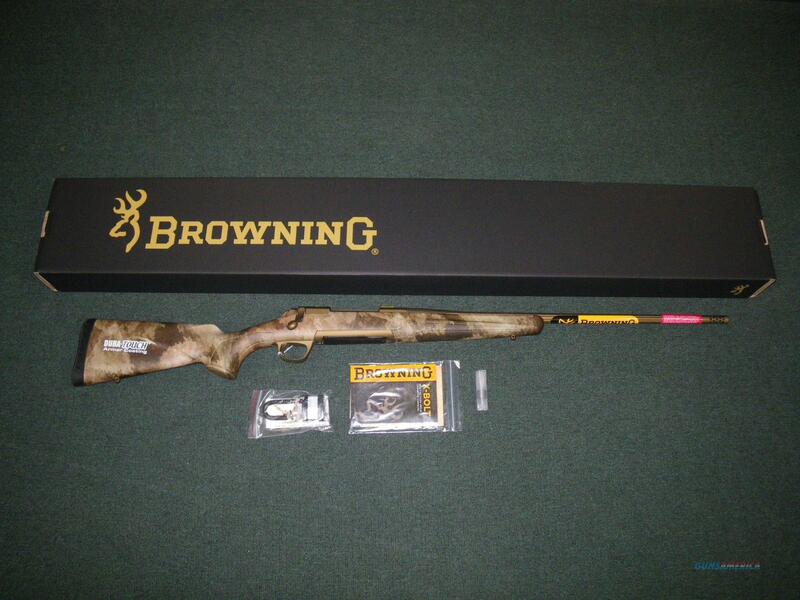 Description: You are bidding on a new Browning X-Bolt Hells Canyon Speed rifle in 6mm Creedmoor with a 22" barrel. The X-Bolt Hell's Canyon Speed rifle is built to exceed your accuracy expectations, straight from the box. The action and stiff, fluted barrel are bedded and free floated to ensure straight shooting. The muzzle brake reduces felt recoil and is easily removed and replaced with an included thread protector. In place of traditional blueing, a Cerakote Burnt Bronze finish was chosen. Not only does it look great, the flat finish aids in concealment. Cerakote is also tougher than other firearm finishes to keep this rifle looking its best for years to come. The lightweight composite stock makes this rifle easy to carry; and the A-TACS AU camo is versatile enough to blend into nearly every background. An Inflex recoil pad tames the recoil of even the most savage magnums by redirecting recoil down and away from your cheek. Carry an extra magazine in your pocket for easy reloading - unlike many production rifles, the X-Bolt doesn't need an aftermarket upgrade to take detachable magazines. RECEIVER – Steel; Cerakote Burnt Bronze finish; Glass bedded; Drilled and tapped for scope mounts BARREL – Heavy Sporter; Cerakote Burnt Bronze finish; Free-floating; Hand chambered; Target Crown ACTION – Bolt-action; 60° bolt lift; Adjustable Feather Trigger; Detachable Rotary magazine; Top-tang safety; Bolt Unlock Button; Cerakote Burnt Bronze finish STOCK – Composite; Textured gripping surfaces; Right-hand palm swell; A-TACS AU (Arid/Urban) camouflage finish; Dura-Touch Armor Coating FEATURES – Inflex Technology recoil pad; Sling swivel studs installed. Displayed images are stock photos. Any questions please feel free to ask (our phone number is in the additional information tab above).